May have had a child named Margaret? Johann Carl Gottlieb Krause was born on May 27, 1845 in Lodenau, Schlesien [Silesia], Prussia. He died in 1885 [sic July 15, 1886], at the age of 40. His profession is unknown. His wife was Maria Luise Krause nee Himpel, born September 23, 1849, in Steinbach, Township of Rothenburg, Schlesien [Silesia], Prussia. She died September 3, 1932, at the age of 83, in Freiwaldau, Township of Sagan [Freiwaldau, District Sagan], Schlesien [Silesia], Prussia. Carl William Krause was born on July 8, 1875, in Steinbach, Township of Rothenburg, Prussia. [Steinbach, Rothenburg, Schlesien, Preussen] He died on September 30, 1950, at the age of 75, in Bischofswerda, Saxon Germany. His profession was glassblower, and he served in the Great War [WW1]. His wife was Anna Luise Krause, nee Krönert, born January 23, 1875, in Bischofswerda, Saxon, died Dresden. She was the daughter of Friedrich August Kroenert. 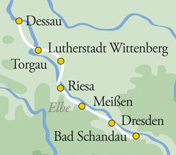 Her profession was midwife, Town of Bischofswerda. - Friedrich August Kroenert [Krönert] was born September 5, 1838 in Roswoin [probably Rosswein, i.e. Roßwein], Sachsen [Saxony] and died October 27, 1910, in Bischofswerda, Saxon. He served in the war against Prussia in the Saxon army in 1866. He was a textile worker [Tūchmacher]. His wife was Caroline Minna Kroenert nee Gerster - daughter of Carl Edward Gerster - who was born August 10, 1846, in Dresden and died February 27, 1925, at the age of 78, in Dresden. 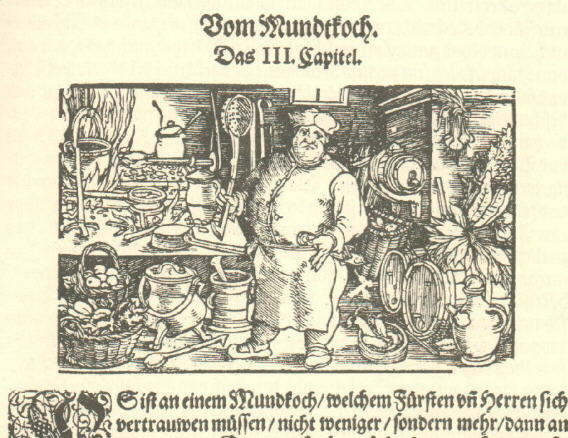 Vom Mundtkoch. Das III. Capitel. Friedrich Wilhelm Krause [Willie] was born on January 18, 1897, in Bischofswerda, Sachsen, Germany. His profession was "lathe" operator. His religion was Lutheran. He served in the Great War [WW1], in France, and on the Eastern Front, including Russia. He emigrated to Canada in 1928, where he was a farmer for one year, and then a commercial fisherman from then on. [oldest known genealogy is on his mother's side: Henry Ernst Wahle, mid 1700's]. His wife was Maria Mietz Kornelsen, born May 5, 1900, in Tiegenhagen, Molotschna, Wollost Halbstadt, Ukraine, Russia. They were married May 16, 1920, in Halbstadt, Molotschna, South Russia, by elder Abr Klassen. - While their son, Heinrich Wilhelm Krause Jr, was a child (i.e. after March 15, 1921), they moved to Germany. In 1928, at the urging of Jake Kornelsen (Maria's brother), they moved to the seventh concession, Wheatley, Ontario. They shortly moved to Port Crewe where W. F. Krause worked on a fishing boat [at Crewe's Fishery]. In 1938, they moved to Point Pelee where he and Maria purchased their own fishery. [Note according to Elisabeth Kornelsen (May 31, 1916-), daughter of Heinrich Kornelsen (April 17, 1876 - 1947)] and Anna Kroeker (September 11, 1884-October 11, 1936), who married Dietrich Reghr: "I was five years old in 1921, when the last German soldiers withdrew from Russia. My sister Mariechen [Maria Mietz Kornelsen (May 5, 1900 - April 2, 1991)] who was married to a Willie Krause [Friedrich Wilhelm Krause (18 January 1897 - 9 December 1983)] , went with them. At the time, they already had a little son, just a baby [Heinrich Wilhelm Krause (15 March 1921 - 15 January 1980)], in the travel cradle. I remembered that time, as from then on we suffered of terrible hunger. Besides me, Liesa, and my parents [who all remained in Tiegenhagen, Molotschna CoIony in Russia], there were also my siblings Lena, Jasch, Heins, Nut, Sascha, Sara, Katja [who all remained in Tiegenhagen, Molotschna CoIony in Russia]. Except for Mariechen, we were still all together [in Tiegenhagen, Molotschna CoIony in Russia]. Heinrich Wilhelm Krause Jr., ["Bill"] was born March 15, 1921 in Tiegenhagen, Molotschna, Wallost Halbstadt, Ukraine, South RUSSIA. 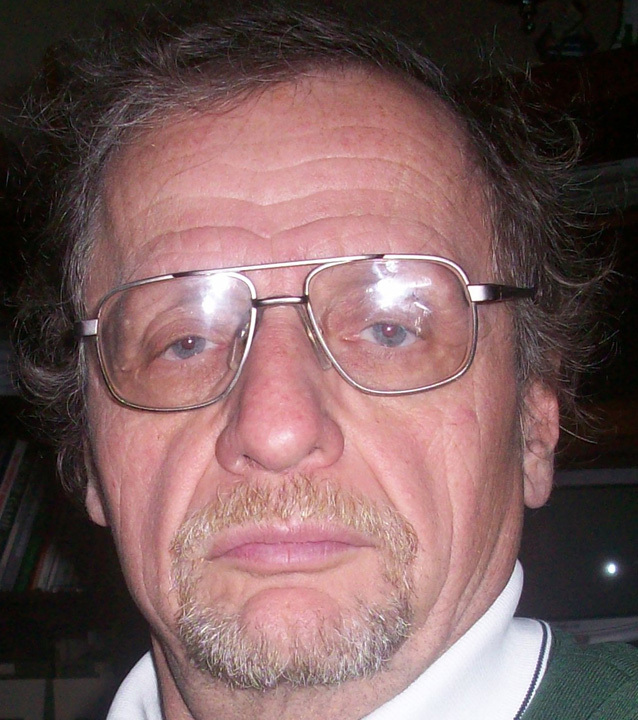 - Bill - 7 years in Germany where he started school - was baptized Lutheran at the age of 5, but changed to Mennonite in 1963. He was a professional commercial fisherman (Port Crewe (1936-1938 [Crewe's Fishery]) and Point Pelee (1938-1978 upon retirement), served on several school boards, was an amateur architect and 1963-1965 chairman of the Building Committee for the construction of the Faith Mennonite Church (Leamington), built mostly by volunteer workers. He was a jack of all trades. In c. 1975-1976 he contracted leukemia and died January 15, 1980 while vacationing in Florida. - Annie was baptized Mennonite in 1941. She was a homemaker, community volunteer, and jack of all trades. 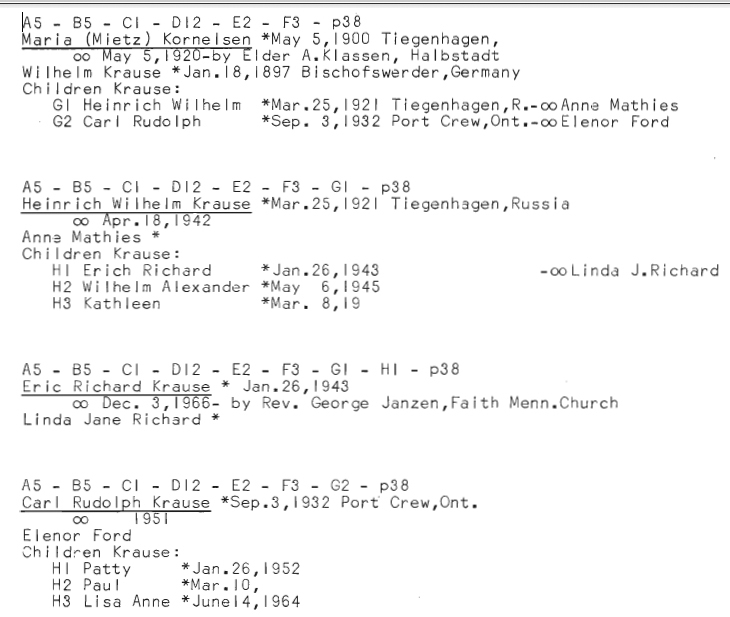 In error: According to K. Peters (compilier), Genealogy of Cornelius Willms, 1730 - 1972 (Winnipeg, March 1, 1973), p. 40, he was born in Bischofswerder. Also, according to his marriage certificate (Halbstadt Mennonite Church, Russia), he was born in Bischofswerder [Bischofswerda], Free State of Saxony.